Best Ring is the latest in point-of-sale technology. Safe and secure transactions in any environment. 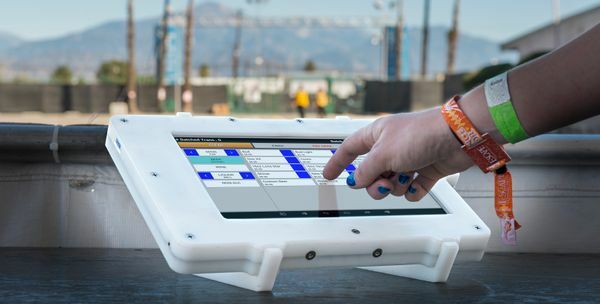 It is a unique system designed for both indoor and outdoor events and festivals. Set up is easy. Terminals are portable and process transactions wirelessly. WIM Group proudly designs and produces many of the components of this cutting-edge, outdoor payment system in Austin, TX. One of the greatest hurdles of outdoor festivals is the weather. The patron wants cold, fresh beer on a hot day. Draught beer can be the hardest to meet this criteria. Once you pour it and set it on a table, the quality begins to degrade. 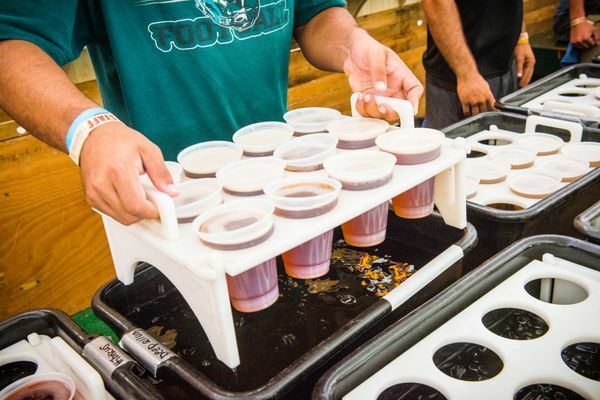 This drink rack is perfectly designed for draught beer at outdoor events. It is a simple design of three pieces that snap together. It fits snuggly in a standard bus tub. Now you can pre-pour your draught beer and keep it in an ice bath to keep up with high volume, peak hours at events. The beer is cold and the customer is happy. Traditionally, in a festival environment the concessionaire rents generic pop up tables to use as bars. This is efficient but unattractive and unstable. Usually, they will wrap the tables in plastic to try hide the tables, adding another expense on top. These pop up bars are durable and sturdy. They hide unattractive attributes of the bar behind a solid wall. The lower surface where the cash drawer rests lifts so that you can hide unsightly cables from point of sale units.